The Hartwood 7′ x 7′ FSC Pressure Treated Oxhill Corner Summer House is one of the more unique, special and interesting looking summerhouses that you can get. Its corner design makes this something that will snugly fit into your garden and it actually is offering you a lot more floor space than you would think. This is one of the highest summerhouses, so even those of you who are really tall will be able to stand up comfortably in here. It has a truly great look to it with the large double doors having a large window on them and two other good sized windows on the side. The roof has this very eye catching overhang that will protect the summerhouse and also allow you to hang things from it. The smooth and very attractive tongue and groove shiplap cladding is made from some very high quality, pressure treated timber. This along with the robust framing inside the summerhouse makes for one very strong and long lasting structure. The design of this will really ensure that you get many years of use out of this. One of the surprising features of this is that the roof is actually made with high quality tongue and groove boarding which as well as being strong is very easy on the eyes. The Hartwood 7′ x 7′ FSC Pressure Treated Oxhill Corner Summer House is one of the most unique and cool looking summerhouses that we have seen. It has such an unusual style that it really does capture your attention from the very first glance. 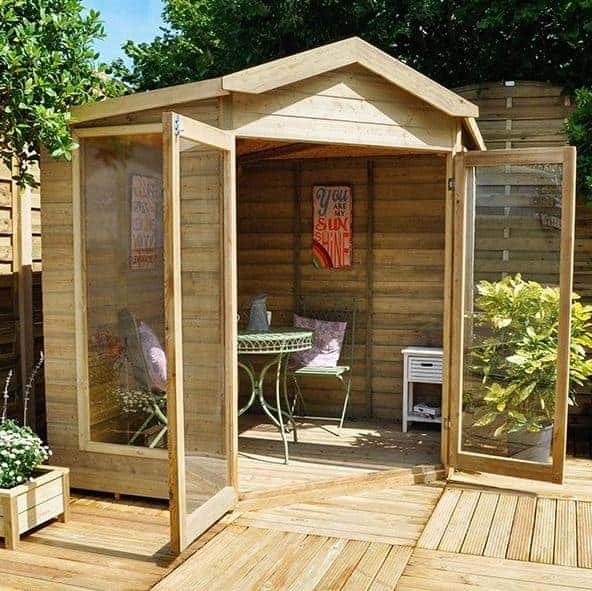 While this is designed to snugly fit into a corner, you could still place this anywhere you like and while this is called a 7 x 7 summerhouse it actually takes up a fair bit more space than its name suggests. This is because the width is 10 feet 1 inch and the depth 7 feet 10 inch, so you will need a decent amount of space to install this. 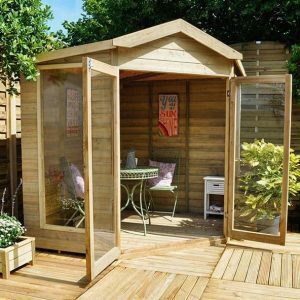 We feel that it does offer you far more internal space than most other mid sized summerhouse so we give it two thumbs up for that. The height is also far larger than we would think as even at the eaves the summerhouse is 6 feet 3 inches. The ridge height is an incredible 7 feet 11 inches high so even you pro basketball players will be able to stand up comfortably inside here. One of the things that really makes this summerhouse stand out from the rest is the fact that even though it is a corner summerhouse they have used an apex roof that has a very nice looking overhang. This is quite unusual as most other corner summerhouses use a pent roof. We love the way the roof looks and as it is made with, tongue and groove boards and covered with some heavy duty felt it is also very strong. We feel that this summerhouse has a look that in many ways resembles a log cabin that you would find deep in the woods. It is made with this lovely, pressure treated tongue and groove shiplap cladding that is an impressive 12 mm thick. The cladding is made so that there is no little areas where water can sneak in and with it being so thick it is also very strong. The cladding is very well attached to a 45 mm x 27 mm frame that is very robust. We really like the framing that they have used for this summerhouse as it makes it a very solid structure that is going to stand strong for many years. You do not want your summerhouse to feel cheap and flimsy and this frame will not allow that to happen. The flooring they have used is solid sheet boarding and we must admit we do wish they used the same tongue and groove boards that they used for the roof. Still the boarding that they have used is strong enough to handle a lot of weight so your chairs, table and other furniture will be fine and chances are you will be covering the floor with some kind of rug anyway so it is not the end of the world that they have not used more attractive flooring. 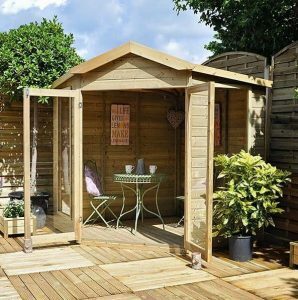 As this is a summerhouse that is pressure treated it will be safe from rot and you do not have to worry about coating the timber with wood treatment. Most other summerhouses require annual treatment so this is a huge bonus. 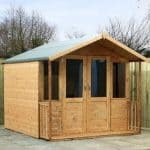 As is the case with other pressure treated summerhouses, the Hartwood 7′ x 7′ FSC Pressure Treated Oxhill Corner Summer House will come to you with a very generous 15 year guarantee that will cover you in the rare case rot does appear. 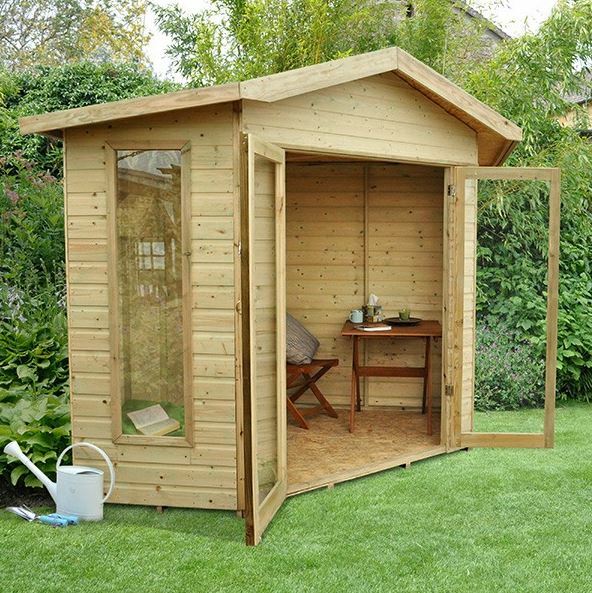 This summerhouse features large double doors that are 6 feet wide and 5 feet 10 inches high. We love how spacious these doors are as it means getting your couch and table inside here is not going to be a pain in the rear end. The doors have a very simple design as they are a small frame and mainly made up from a large piece of shatterproof styrene. We love the look of these doors and they will certainly help fill the summerhouse up with light. The large doors are not the only way light will be able to beam inside the summerhouse as on the sides there are two large windows. We really like the look of these windows and they are made from the same shatterproof styrene as the ones on the door. To give the windows a little extra personality they are surrounded by this very smart looking thick frame. Those large double doors lock up very well and adding something such as a padlock would be very easy and give you that added bit of security. 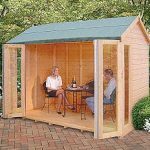 In general this is a summerhouse that is very secure and we are sure that you will have no concerns at all about anything you leave inside here. You are not getting much privacy with this summerhouse as the windows on the sides and the door are so large. We do feel that windows like this though would look fantastic with a set of blinds or some classy looking curtains which would give you some privacy. One way that we feel you could customise the summerhouse is by adding something to the overhang. We feel that a set of wind chimes or some kind of hanging basket filled with nice flowers would look great. While the pressure treated tongue and groove shiplap cladding looks great in its natural state. If you did want to change it up then you could always give it a coating of paint. 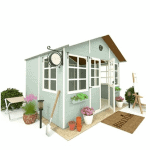 The only extra that is on offer is a plastic shed base that may be of interest to you if you are installing the summerhouse on a grassy area. While we do really like the idea of this, we must say that at, £149.99 it is a little expensive. This is one very high quality summerhouse where they have really done an incredible job and used very impressive materials to ensure a strong and great looking building. 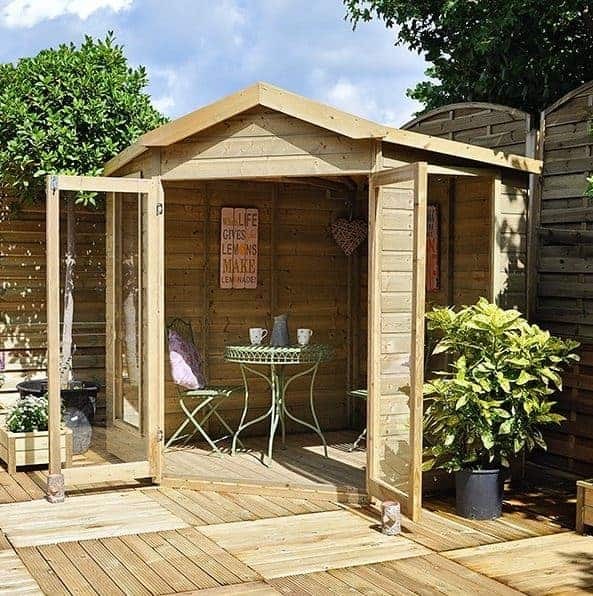 If you do give the summerhouse a little TLC over the years, then the pressure treated timber and the design of the summerhouse will ensure that you will be able to enjoy this for many decades. With this being a corner summerhouse it is a very interesting shape so you will have quite a bit of space to make use of. We feel that this kind of summerhouse lets you really be creative when it comes to laying it out. With this being such a high summerhouse, you will certainly need a person to help you install it, but this is really the only fiddly part of building this. In general this should not be too hard and 6-8 hours is the average time it would take to install something like this. Even though this is priced a little higher than similarly sized summerhouses, we do feel that it is worth this extra money as it is very well made and has a very unique style. 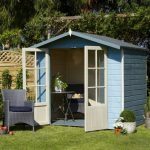 Final Thoughts: The Hartwood 7' x 7' FSC Pressure Treated Oxhill Corner Summer House is one very impressive looking summerhouse that has a lot of style and personality. We really like the overall look of this and feel that the apex roof with overhang, large windows and the double doors make this such a fantastic looking structure that it is impossible not to be impressed with it. 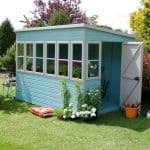 The price for all this quality is a little on the high side, but we do feel that it is well worth considering saving up a little bit longer to get a summerhouse like this before you pull the trigger on a cheaper one.